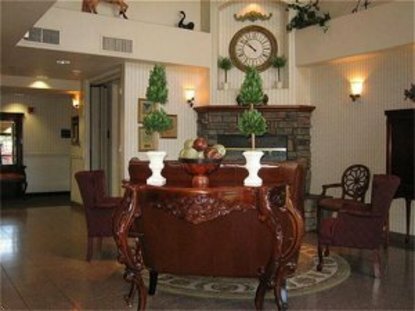 The award winning Holiday Inn Swan Court is located just 12 miles south of Fresno and 22 miles north of Visalia and just 17 miles from Hanford located on Highway 99. The Holiday Inn Swan Court is a non-smoking hotel that offers free wireless Internet, a private business center for Internet access and printing. Large gym featuring a universal weight system, treadmill and several cardio units. Free Starbucks coffee served daily as well as fresh baked scones and chocolate chip cookies. Priority Club members are given additional amenities. Our rooms have been newly renovated and feature 27 inch televisions with movies and games on command, refrigerator, microwave and Starbucks Coffee. We provide complimentary fresh baked cookies in our lobby daily along with Starbucks Coffee and Freshly baked scones. Adjacent to our property is the Spike N Rail Restaurant featuring American cuisine. Our banquet facility seats up to 350 guests. In the front of the restaurant is our Starbucks Coffee counter and Bakery featuring fresh baked pastries daily. This hotel is committed to providing accessible facilities under the American Disabilities Act. If your accessibility needs are not met, please contact the Hotel Manager on Duty. Should you require additional information regarding accessible facilities for guests with disabilities, please call 1-800-Holiday (U.S. and Canada) or contact the hotel directly. For the hearing impaired, TDD service is available at 1-800-238-5544 within the U.S. and Canada.